We've been talking about digital transformation for a while now, will the journey ever end? Francis Meston, Executive Vice-President for the Middle East and Africa, and Turkey CEO, Atos. Businesses are being told they need to digitally transform if they want to survive in a highly disruptive environment. 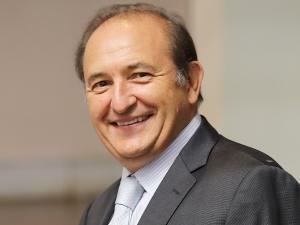 Francis Meston, Executive Vice-President for the Middle East and Africa, and Turkey CEO at Atos, says: "We're entering a new wave of digital transformation that's being driven by the Internet of things, artificial intelligence and blockchain. Over and above these, mobility, the cloud and big data are revolutionising the capabilities of technology. "We're seeing progressive new technologies that are presenting businesses with opportunities to do things differently, and better, than they ever did previously. But, equally, businesses are facing new challenges that require an agility that only digital transformation can bring." Meston explains: "Digital transformation is no longer a future concept; it is a concrete, global reality that all enterprises need to deal with in order to succeed. And it has to be implemented both internally within the business as well as across its interactions with customers and suppliers alike. "Faced with stiff competition from digital natives and an overriding expectation from the customer for digital services, businesses have a fantastic opportunity to transform the way in which they operate. "However, they first need to understand the needs of this new digital world and the impact these demands are having on businesses." Digital transformation is at a turning point. As the Internet of things, artificial intelligence, real-time processes and the cloud begin to blur the physical and the digital worlds, data becomes the heart of the business. The resulting shock waves are deeply transforming the business environment, says Meston. According to analysts, 70% of leaders in all sectors may be disrupted in the next 10 years. The key question for all businesses, regardless of sector, is how to be a disruptor rather than being disrupted? He says: "Digital transformation is about radically changing the customer experience. In order to achieve this, a business needs platforms that encourage creative engagement and intelligent analytics that span the entire organisation. "This disruptive digital world that we operate in is challenging every organisation to operate more efficiently, effectively and securely than ever before. Businesses have to reduce risk, improve outcomes and create a highly productive, collaborative environment to attract and retain the very best staff." This means eliminating dependence on all low-value, high-volume manual processes, as well as liberating staff to do real business. It's also about reducing error and the risks that go with it. Digital sits at the heart of any operational business transformation, but the real challenge is how to make the shift without any disruption to the business. Meston says: "Firstly, businesses have to understand that digital transformation isn't a once-off implementation, it's a continuum of change that's implemented across the business. Secondly, in order to be successful in their digital transformation journey, organisations need to partner with experienced digital leaders to help them migrate key processes into the new digital era, create the right environment and infrastructure to support future transformation and work closely with internal teams and stakeholders to manage and execute change. "It is essential that the selected partner is able to use your company data to innovate, reinvent business models and deliver enhanced customer experiences." Although the majority of businesses are some way along their journey towards digital transformation, there are still several common barriers to digitisation that most companies will face at some stage. Meston says: "One of the most common barriers is simply resistance to change within the organisation. People tend to hold on to legacy processes because they are familiar with them. Implementing any new process needs to be done sensitively and transparently to ensure that everyone buys into the new way of doing things." Sometimes, the business has so many legacy processes in place that it doesn't seem possible to digitise all of them. The mountain seems insurmountable. In this case, he says, businesses should start out by digitising one division at a time, perhaps finance or HR, and then gradually work through the business. When digital transformation is regarded as an IT initiative, instead of a business imperative, implementation can also prove tricky. "Digital transformation has to be driven from board level down, and not just by the IT division, to ensure its success." Another concern commonly expressed is around the security of data that's being moved to the cloud. He says: "Businesses need to ensure that they implement the necessary security measures to protect themselves and their data against cyber threats." * Prepare for the human, security and legal impact of intelligent autonomous robots. To read more about how businesses can survive in a disruptive environment, read this white paper. For an overview of the top emerging disruptive technologies, click here.